Mattogno, Graf & Kues claim that burning the victims’ corpses at Nazi extermination camps would have required enormous quantities of fuel that are at odds with the evidence if they were logistically obtainable at all. 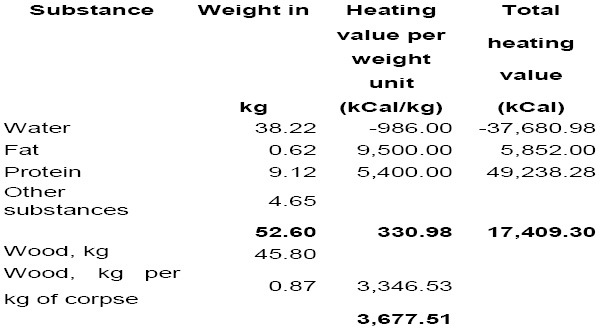 The main parameters on which this claim rests are the average weight of the corpses to be burned and the average amount of wood or wood equivalent required for cremation per kg of corpse weight. As concerns the first parameter, the "Revisionist" authors present various deportation data in their Sobibór book according to which children up to the age of 16 made up just 17.05 % of deportees to that camp from the Netherlands, 5.5 % of deportees from France, 27 % of deportees from Polish and Soviet territories, 25 % of deportees from Slovakia, 6.91 % of deportees from Germany and Austria, and 11.5 % of deportees from Prague. Considering the numbers of deportees from each place of provenance, this means that 36,400 out of 169,000, or about 21.5 % of the total, were children below the age of 16. The percentage assumed for Polish and Soviet territories is based on figures about the Jewish population in the Łódź Ghetto on 30 June 1942, whereby out of a total of 96,874 inhabitants 25,947, or 26.8 %, were children under the age of 16. This is hardly an appropriate yardstick insofar as children – especially younger ones – were among the first to be deported due to their uselessness for physical labor. Thus in the Warsaw ghetto 99 % of all children had been removed by November 1942 according to a ghetto statistic. As concerns the Łódź Ghetto and the surrounding areas, the history of deportations up to the end of June 1942, reconstructed by the Bonn District Court, suggests a similar situation: according to a report of the Łódź Gestapo dd. 9 June 1942, a larger number of Jews not able to work were "evacuated from the ghetto and handed over to the special detachment", including 44,152 Polish Jews and 10,993 deportees from the Old Reich, the Ostmark (Austria) and the Protectorate Bohemia and Moravia (Czechoslovakia). 9,000 Jews were "evacuated" from the Lentschütz district, 1,000 being left behind because they were urgently required for carrying out Wehrmacht tasks. Of the about 6,000 Jews in the Löwenstadt Ghetto, around 3,000 were "evacuated" as not able to work, while the remainder, which consisted of skilled workers, was taken to the Łódź Ghetto. A report from the same office dated 3 October 1942 informed about the "evacuation" in September of about 15,700 Jews sick and unable to work from the Łódź Ghetto. It stands to reason that in transports of people unable to work children, especially such of younger ages, were more strongly represented than in the general population. According to a source quoted by Mattogno, demographer Jakob Leszczynski, the percentage of children aged 14 or under among the Jewish population of Poland in 1931 amounted to 29.6%, that is, little less than 1/3. Though still far below the presumable actual proportion of children in transports from Polish ghettos to Nazi extermination camps, assuming that one third of these deportees were children aged 14 or under is more realistic than MGK’s suggestion. Assuming that one third of deportees from Polish ghettos were children under 14, and considering that Polish Jews in the 1940s tended to be smaller-sized than Germans and were furthermore seriously malnourished, I estimated the average weight of an adult+adult+child group of deportees from a Polish ghetto to be 34 kg. This can be considered the average weight of arrivals at the two Aktion Reinhard(t) camps that overwhelmingly received deportees from Polish ghettos, Bełżec and Treblinka. There were also a few long-range transports that reached Treblinka directly from Theresienstadt in 1942 and from Greece and Yugoslavia in 1943, but the number of deportees from these places was too low, in comparison to that of deportees from Polish ghettos, to require considering a significant impact on the average weight of deportees, moreover as the proportion of children among the deportees from Polish ghettos must have been somewhat higher than among the general population. At Sobibór the proportion of deportees taken to the camp from Polish ghettos was somewhat lower, making up less than one third of the total according to one estimate. 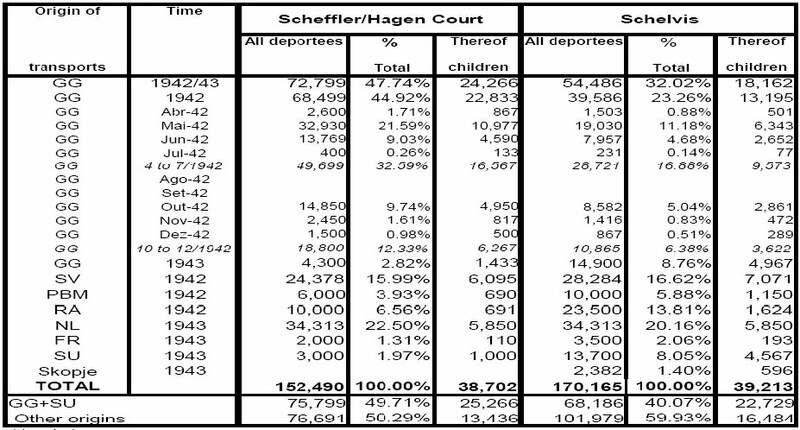 Table 3.1 below (which, like all following tables, can be enlarged by clicking on it) shows the breakdown of deportees to Sobibór by periods and places of origin according to the estimates of German historian Wolfgang Scheffler (submitted at the 1965-66 Sobibór trial in Hagen, Germany) on the one hand and Dutch historian Jules Schelvis on the other. In the following Schelvis’ figures shall be used because they are the ones that MGK refer to, even though Scheffler’s research suggests that they are on the low side as concerns deportations from the General Government. The respective distribution between children and adults, assuming that for the deportees from the occupied Soviet territories it was the same as for the deportees from Polish ghettos, and that for deportees from other places of origin it was as claimed by MGK, would thus be 39,213 children (23.04%) vs. 130,952 adults (76.96%), with transports from the General Government and the occupied Soviet territories carrying 68,186 deportees, thereof 22,729 children (one-third), while transports from other places of origin carried 101,979 deportees, thereof 16,484 children. As concerns the stature of Jews from outside the occupied Polish or Soviet territories, I assume that it was similar to that of other Europeans at the time. In this respect a contemporary article reveals that the average weight of Scottish males in 1941 was 138.2 lb (62.7 kg), while a recent online article informs that "The women in the 40’s weighed an average 61 kg while the women of today weigh an average 65 kg." Assuming that adults on transports to Sobibór were equally divided into men and women (actually women predominated on transports from the Netherlands, according to Schelvis), their average weight was thus about 62 kg. Assuming that children weighed half that much, their average weight was about 31 kg. Considering the aforementioned calculations regarding deportees from the occupied Polish or Soviet territories, the average weight of deportees to Sobibór can thus be established as shown in Table 3.2 below. The figures for all other three camps, assuming an average weight of 34 kg for Bełżec and Treblinka and of 48 kg for Sobibór, would thus be approximately as shown in Table 3.3 below. How much wood was required to burn this mass of human bones and tissue? This question takes us to the second parameter of logistical feasibility, the amount of wood or wood equivalent required for cremation per kg of cremated corpse mass. However, MGK's most grievous omission in this context concerns a source that has not only been mentioned by me on several occasions, but was also first pointed out, ironically, by Carlo Mattogno himself. In his otherwise unremarkable article about his combustion experiments with flesh and animal fat, Mattogno did his critics the favor of copiously quoting the writings of German engineer Wilhelm Heepke. Particularly interesting in Heepke's writings quoted by Mattogno is the reference to burning experiments carried out in the early 20th Century by two German veterinarians, Dr. Lothes and Dr. Profé of Cologne. These professionals managed to burn carcasses on grids over pits in a rather short time and with rather low fuel expenditure, their most satisfactory results being achieved by a method in which a pit was excavated from the sole of a larger pit and the carcass was placed on a grid upon the inner, smaller pit (which contained the burning material ignited to set the carcass on fire) below ground inside the outer, larger pit. There are some striking similarities between the carcass burning methods applied by Dr. Lothes and Dr. Profé on the one hand and the methods applied for burning the corpses of those murdered at the Aktion Reinhard(t) extermination camps on the other, which come across as applications on an enormous scale of Dr. Lothes and Dr. Profé’s methods, or some of those methods. The Sobibór roasters, according to the evidence on which the Hagen court based its findings of fact, were inside a pit. The Hagen court’s description (see section 2.2) is reminiscent of the grid burning procedure that Heepke considered the most efficient, that with the grid inside the pit. As concerns Treblinka, the descriptions of the cremation devices in the judgments at the Düsseldorf trials of Treblinka commandant Franz Stangl and Treblinka staff members Kurt Franz et al, and by Ukrainian guard Pavel Vladimirovich Leleko (see above section 2.3), mention a pit underneath the grid in which a fire was lit in order to set the corpses on the grid on fire. 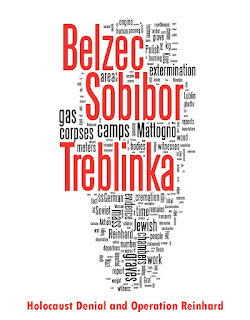 The procedure adopted at Treblinka seems to have been similar to those of Dr. Lothes & Dr. Profé's experiments in which the carcass was placed on a pit above ground, except that at Treblinka there was a space between the bottom of the grid and the top of the pit, corresponding to the above-ground height of the concrete blocks mentioned by Leleko and at the trial of Franz et al. The reason for this is not clear, but it is possible that the creator of this structure wanted more air assisting the incineration than was provided by the grid structure anyway. The importance of good air circulation has been mentioned above in connection with the "raised human size brazier" that the inventor of the Mokshda Green Cremation System tried to introduce in 1993. It should also be pointed out that a very abundant supply of air is what makes for high temperatures and very complete combustion in air curtain incineration. 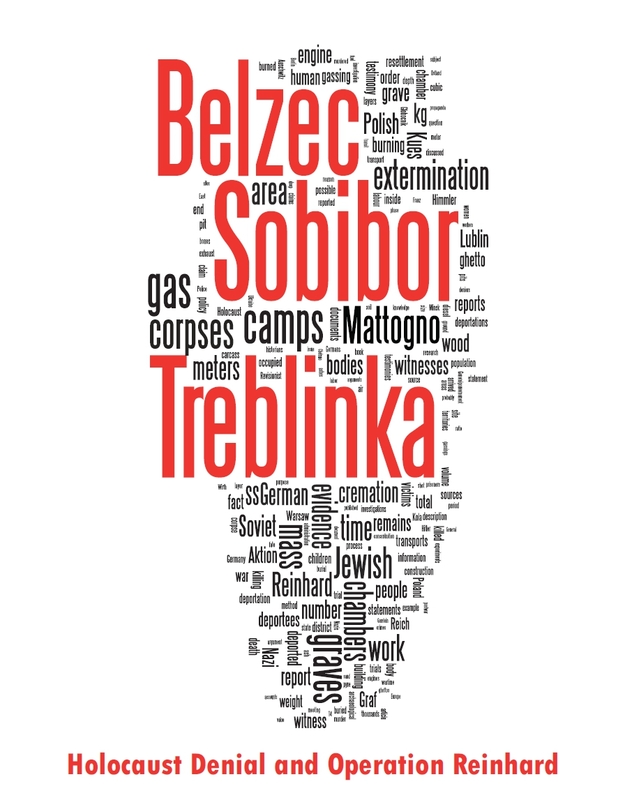 As concerns Bełżec, not much is known about the configuration of the grid cremation facilities used at these camps, but it stands to reason that it must have been similar to the one at Sobibór or at Treblinka (see section 2.1). Average of experiments IV to VI: 4.30 E.U. 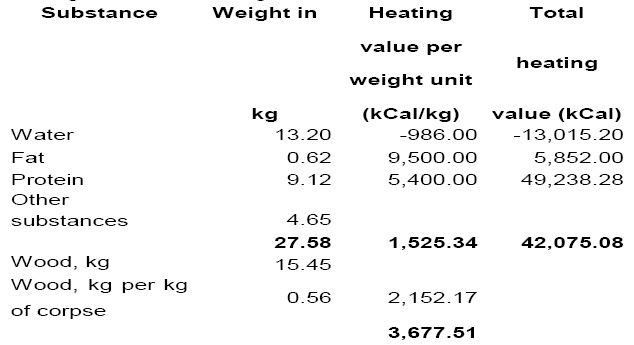 per kg of carcass (= 0.48 kg of wood per kg of carcass). If, as these data suggest, the incineration of numerous carcasses requires less fuel per kg of carcass than the incineration of just one carcass, it stands to reason that the rates achieved by Dr. Lothes and Dr. Profé could also be improved upon when incinerating not one, but several hundred carcasses. It would also not be surprising, under this assumption, if mass incineration of corpses at the Nazi extermination camps achieved better fuel consumption rates than the grid burning experiments conducted by these two veterinarians. Mattogno has a problem with Dr. Lothes and Dr. Profe’s experiment results referred to by Heepke, insofar as they point to the possibility of burning animal carcasses and human corpses with comparatively small amounts of wood. He tried to solve this problem by assuming that Dr. Lothes and Dr. Profé had not achieved a complete combustion of the carcasses but only "more or less complete carbonization", and by burning small chunks of meat in his backyard to demonstrate a weight-to-weight ratio more suitable to his argumentation, which he postulated as being a "more reliable" indicator of fuel consumption in cremating animal carcasses or human corpses. On 15 July the skinned carcass of a horse together with the viscera, weighing 12 cwt, was burned in an open fire. The fire was burning inside a pit about 1 meter deep. The carcass was placed on two iron T-carriers two meters long placed across the pit. 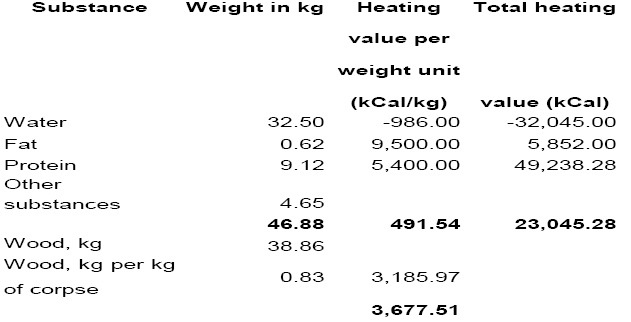 Besides low amounts of straw 2 cwt of wood, 3 cwt of briquettes and 25 kg of coal tar served as burning material. At first a ½ cwt of wood and 1 cwt of briquettes were set on fire below the carcass drenched in tar, the remaining part of the burning material being gradually added as necessary. The whole thing was set on fire at 6 hours in the afternoon. In the following afternoon at 2 hours, that is 20 hours later, only a weakly smoking heap of ashes was left. The smoke developed was considerable only as long as the tar was burning. 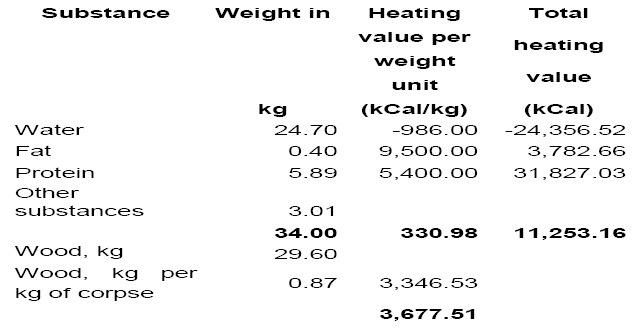 The costs were 2.40 marks for 2 cwt of wood (at 1.20 marks per unit), 2.10 marks for 3 cwt of briquettes (at 0.70 marks per unit) and 2.25 marks for 25 kg of coal tar (at 0.09 marks per unit), altogether 6.75 marks. The carcass was reduced to a weakly smoking heap of ashes, and it is unlikely than any lesser result would have satisfied Lothes & Profé, considering that they were looking for a means to render harmless the carcasses of animals killed by anthrax. As the authors pointed out in their article, anthrax bacilli can form extraordinarily resistant spores, which can remain in the soil for "years and decades". As experimentally demonstrated by Lothes & Profé, these bacilli are able to survive in dry spleen pulp and to pass with the help of water through strata six feet thick of very compact sand and gravel in about thirty hours. One therefore shouldn't take any chances with anthrax bacilli, but Lothes & Profé were confident of having developed a method whereby it would be possible to safely destroy anthrax carcasses with relatively limited means - and also in a rather short time, at least when applying the "double pit" burning method they recommended. The experiments of Lothes & Profé were duly noted at the time also outside Germany, as is shown by an excerpt from the 1902 Eighth Annual Report of the Pennsylvania Department of Agriculture. c) There are good reasons to assume that the fuel-weight to carcass-weight ratio achieved in burning corpses at Nazi extermination camps was much lower than 2:1. 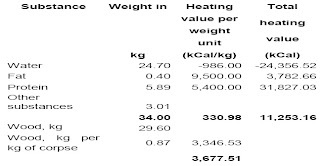 Aggarwal’s "raised human-sized brazier" may have achieved a ratio of 100 kg of wood vs. 70 kg of corpse = 1.43:1, and the carcass-burning experiments I to III conducted by Dr. Lothes and Dr. Profé in the early 20th Century (the comparatively less fuel-efficient of their experiments) showed an average ratio of 0.56:1. Descriptions of the burning process at Sobibór actually suggest a similarity to the more fuel-efficient of Dr. Lothes & Dr. Profé’s experiments, the ones at which a ratio of 0.48:1 was achieved. d) There's no reason why SS - expert Floss (the man who according to the Stangl judgment "brought the grid into the right position" at Treblinka) could not have achieved in mass burning a ratio equal to or lower than what had been achieved by Dr. Lothes & Dr. Profé burning individual carcasses in the early 20th century. Therefore the ratio of 0.56:1 that the veterinarians achieved in the comparatively less fuel-efficient of their experiments – ignoring the possibility of a lower ratio at Sobibór, for good measure – shall in the following be considered as the likely expression of wood or wood-equivalent expenditure on cremation grids at Bełżec, Sobibór, Treblinka and Chełmno, as soon as they had been properly arranged. 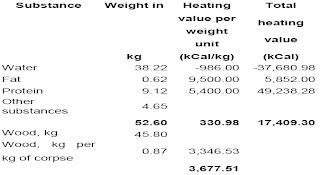 Considering the numbers and average weights of corpses to be burned established above (Table 3.3), the amounts of wood required for cremation would thus be as shown in Table 3.4. 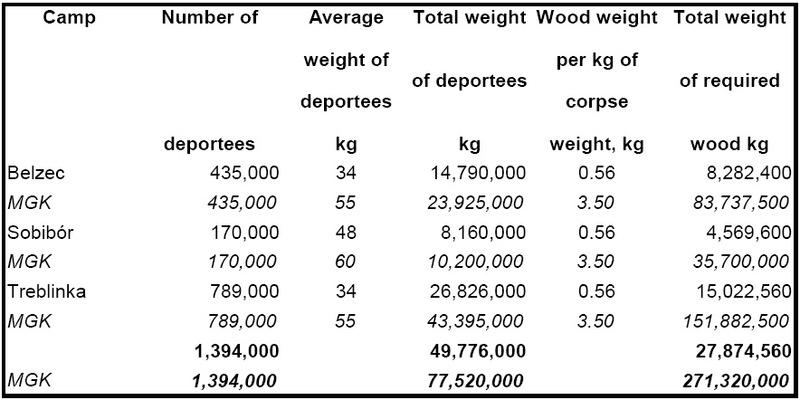 The average life weights of deportees and the wood-to-corpse weight ratio assumed by MGK lead to considerably higher wood requirements, as also shown in this table for the same numbers of deportees. The conclusion is that one would overestimate wood requirements by a factor of almost ten using the life weights and wood-to-corpse weight ratios assumed by MGK. To be fair, it should be pointed out that regarding Bełżec and Treblinka the respective authors (Mattogno in the former case, Mattogno & Graf in the latter) don’t use the corpses’ assumed life weight for their calculations but what they claim was the corpses’ decomposed weight – 45 kg. This leads to the question what impact the corpses’ decomposition - the corpses at Bełżec, most of the corpses at Treblinka and a significant part of the corpses at Sobibór were in some stage of the decomposition process at the time of cremation – is likely to have had on wood requirements for cremation. Of course fat and proteins don’t just disappear, unlike the body fluids that seep into the soil. They are transformed into glycerol and fatty acids, as MGK themselves point out. Glycerol and fatty acids (the latter including butyric acid, which at the stage of butyric fermentation gives corpses or carcasses a cheesy smell) are flammable substances with a considerable calorific value, which means that the heat balance asset of fat and protein is not completely lost when both break down. The correctness of the above reasoning is confirmed by the fact that only very low amounts of additional fuel are required to burn carcasses reduced to only their bones. Mattogno, Graf & Kues present an example supposedly corroborating their claim that burning decomposed corpses requires no less or even more fuel than burning fresh bodies. The burning of 21,000 decomposing carcasses at Epynt in Wales between 24 April and the end of August 2001, they write, required an amount of fuel and a timeframe far in excess of those that had been observed with fresh carcasses. However, a look at the source referred to reveals that this claim is a half-truth at best. The Epynt Enquiry Report describes a rather disastrous, badly mismanaged procedure on page 4. After a failed attempt to burn them in the burial pit, the carcasses were moved to the burn site "in their deteriorated state, mixed with mud and stones". The pyre temperature was too low for safe burning, for the pyre "was built on the flat with no trench to create the draft usually necessary to ensure high temperatures for burning". Moreover the pyre "was in fact over 400 metres long (whereas according to the EA's report it should have been 250 metres long) and was so wide that the machines used to stoke up the fire could not reach the centre which left much of the carcasses only partly burnt". Those machines caught fire themselves, leading to the use of "fire hydrants alongside the pyres to dowse down burning machines". One can see that the outrageously high fuel expenditure was due to several factors at play here besides the deterioration of the carcasses. First of all, the carcasses in their deteriorated state were burned together with mud and stones, meaning that the coal expenditure was not due to the carcasses alone. Second, the pyre was inadequately wide and didn’t allow for air circulation, which rendered the burning very inefficient. Third, fire hydrants alongside the pyre dowsing down burning machines would hardly have improved the already low burning efficiency. In sum, this showpiece of incompetence can hardly be used as evidence in support of the counterintuitive proposition that burning decomposed corpses requires more fuel than burning fresh ones. A more pertinent argument of the "Revisionist" authors is derived from the so-called Minnesota Starvation Experiment (November 1944 through December 1945), in which 36 volunteers underwent a restricted diet over 24 weeks and saw their weight dropping from an initial average 69.4 kg in the last week of the control period to 52.6 kg at the end of 24 weeks of semi-starvation, a loss of 16.8 kg. Water eventually represented 37 % of the lost body mass (6.2 kg), protein 9 % (1.5 kg) and fat 54 % (9.1 kg). 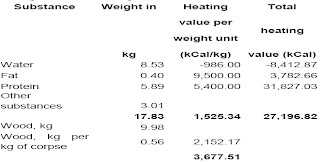 MGK argue that "the loss of 6.2 kg of body water saves some 6.2×(640+0.493×700) ≈ 6,100 kcal in terms of fuel requirements, as opposed to a loss of available fuel of (9.1×9,500+1.5×5,400) ≈ 94,500 kcal caused by the loss of body fat and proteins. This results in a negative balance of some 88,400 kcal, the equivalent of 23 kg of dry wood." 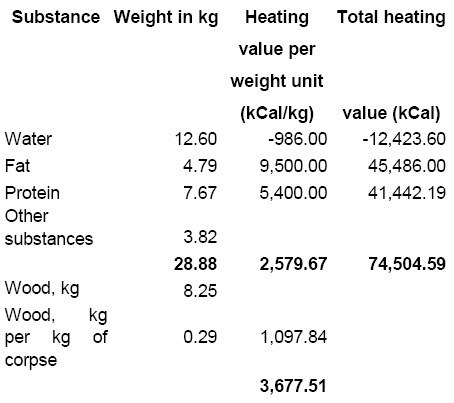 In the next table (3.8), the corpse has the weight of an MSE test person at the end of the experiment (52.6 kg) after losing 6.2 kg of water, 1.5 kg of protein and 9.1 kg of fat. 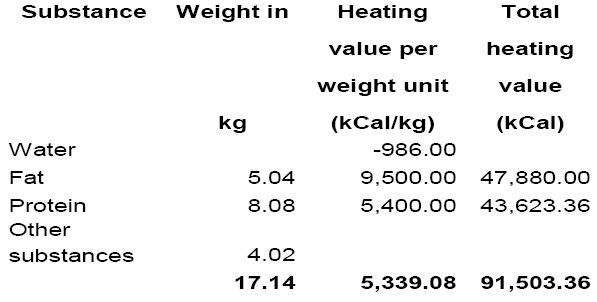 It’s calorific value per weight unit is down to 330.98 kCal/kg, which means that wood must contribute an additional 3,346.53 kCal/kg to reach the 3,677.51 kCal/kg required for combusting the corpse. These 3,346.53 kCal/kg correspond to 0.87 kg of MGK’s wood, which means that the wood-to-corpse weight ratio goes up from 0.56:1 to 0.87:1, and the total amount of wood required for cremation rises from 38.86 kg to 45.80 kg. 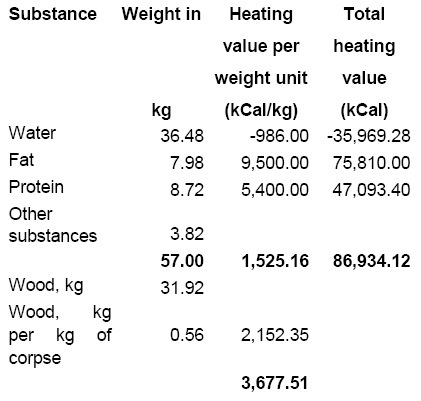 The next table (3.9) shows how much water loss due to the corpse’s decomposition would be required to bring wood consumption back to the original 38.86 kg in absolute terms. A water loss of merely 5.72 kg (ca. 15 %) from 38.22 kg to 32.50 kg, bringing the corpse’s weight down to 46.88 kg, would be sufficient for this purpose, the wood weight to corpse weight ratio improving from 0.87:1 to 0.83:1. For the original wood weight to corpse weight ratio of 0.56 to be restored, a higher but not a total water loss is required. In the following table (3.10), the corpse’s water content has gone down from 38.22 kg by 25.02 kg (ca. 65.5 %) to 13.2 kg. The corpse now weighs 27.58 kg, and 15.45 kg of wood are required to burn it. What this exercise shows is that the negative effect of emaciation on fuel requirements is compensated when the corpse has been decomposing long enough to have lost a substantial part of its remaining water content. Applying this exercise to the average weights of deportees to Nazi extermination camps established above (34 kg for deportees from ghettos in Poland or the Soviet Union, 57 kg for long-range deportees from outside these areas, see Table 3.2), and considering how many of the deportees had been decomposing in mass graves for how long before being cremated, it is possible to roughly estimate the presumable wood expenditure at each of these camps. The first camp for which this will be done is Sobibór as the most complex case, with a significant if not predominant influx of deportees from outside malnourished Polish and Soviet ghetto areas. 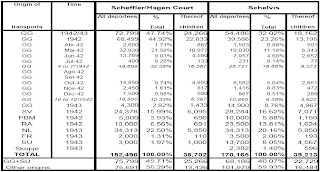 According to the Hagen Court’s list (see above Table 3.1), 72,799 out of 152,490 deportees to Sobibór were from the General Government. Of these 68,499 arrived in 1942, and of these in turn a total of 49,699 (72.55 %) arrived before the August-September break preceding the start of cremations in October 1942, 32,930 thereof in May 1942 alone. Schelvis gives no figures for arrivals from the General Government in 1942, so the figure of 39,586 in Table 3.1 was arrived at by deducting from Schelvis’ total the figures he gives for deportees from the GG in 1943 and for deportees from places of origin outside the GG. Applying the percentage derived from the Hagen Court’s list to these 39,586 one gets 28,721 deportees from the GG who arrived until the end of July 1942, thereof 19,030 in May 1942, as shown in Table 3.1. These bodies would have been lying in the mass graves for at least two months by the time they started being cremated. Those that had arrived in May 1942 would have been lying in the graves twice that long. Considering the timeline of the stages of decomposition, and the fact that the mass graves were obviously not closed until they had been filled to the brim, it is assumed that the speed of decomposition was closer to that of decomposition above ground than to that of decomposition below ground and that these corpses had at least reached the stage of butyric fermentation and most of their water had gone. This, in turn, means that whatever negative influence these victims’ malnourishment before being murdered may have had on fuel requirements was at least compensated by the loss of water. 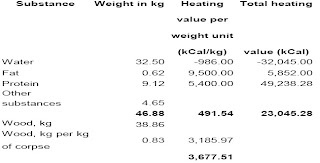 If the deportees upon arrival, weighing 34 kg on average due to malnutrition, consisted of water, fat and protein in the same proportions as an MSE test person after the same, their calorific profile was as shown in Table 3.11, meaning that burning these corpses immediately after death would have required 29.60 kg of wood per corpse (a weight ratio of 0.87 to 1). 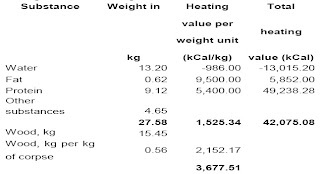 However, if after some months in the grave most of the remaining water had vanished, as in the example of Table 3.12, the body would weigh just 17.83 kg and require only 9.98 kg of wood for burning (corresponding to the weight ratio of 0.56 that has been assumed for burning the non-decomposed corpse of a sufficiently nourished person). Assuming an (unrealistically high) loss of 40 % of the remaining fat and 12 % of the remaining protein (as considered in MGK’s example calculation regarding decomposed bodies) together with the water loss considered in Table 3.12, the amount of wood required to burn the corpse would be accordingly higher (weight ratio: 0.62 to 1), as shown in Table 3.13. In the following it will be considered that not all water and a significant portion of the fat and protein was lost (lost completely, that is, which in actual fact doesn’t happen because fat and protein break down into substances with a considerable calorific value like glycerol and butyric acid, see above), which corresponds to the scenario shown in Table 3.13. The 28,721 decomposed deportees from the GG assumed above as having arrived until the end of July 1942 would thus have weighed 16.96 kg on average at the time of cremation, which would have required 10.54 kg per corpse (weight ratio: 0.62 to 1). If about 80,000 deportees arrived at Sobibór while the disposal method was still burial, this would mean that either the 28,721 figure for GG Jews in 1942 derived from Schelvis is too low or that the balance of 51,279 arrived in this period from Slovakia, the Protectorate Bohemia and Moravia and the Reich and Austria. In the latter case, the calorific profile of an average deportee in this balance, who is assumed to have not been suffering from malnutrition like Polish and Soviet Jews, would be as shown in Table 3.14, considering the average weight of 57 kg established for deportees from places outside Poland or the Soviet Union (see Table 3.2) and a distribution between water, fat and proteins as assumed by MGK. Burning these bodies immediately after death would thus have required 31.92 kg of dry wood or wood equivalent per body. After losing about 65.5 % of their water (like the bodies in Tables 3.12 and 3.13), 40 % of their fat and 12 % of their protein as was assumed for the Polish or Soviet Jews (Table 3.13), these neither Polish nor Soviet Jews would have the calorific profile shown in Table 3.15. The average body weight would have gone down to 28.88 kg, and as the body would have lost most of its water but still have considerable amounts of fat and protein, unlike the body of a person that had suffered from malnutrition before being murdered, burning such body would require only 8.25 kg of wood. The bodies that were not buried before cremation are divided into two categories, assuming the breakdown of Schelvis’ figures in Table 3.1 and that the number of ca. 80,000 buried corpses is correct: 39,465 from areas where Jews were subject to severe malnutrition (10,865 from the GG between October and December 1942, 14,900 from the GG in 1943 and 13,700 from the occupied Soviet territories in 1943) and 170,165 – 80,000 – 39,465 = 50,700 from areas whose Jewish population was more or less normally fed prior to deportation. A - Decomposed/dehydrated corpses of sufficiently nourished deportees (Table 3.15). Average weight: 28.88 kg. Weight of wood required for cremation: 8.25 kg. Weight ratio: 0.29. B – Decomposed/dehydrated corpses of malnourished deportees (Table 3.13). Average weight: 16.96 kg. Weight of wood required for cremation: 10.54 kg. Weight ratio: 0.62. C – Non-decomposed corpses of malnourished deportees (Table 3.11). Average weight: 34 kg. Weight of wood required for cremation: 29.60 kg. Weight ratio: 0.87. D - Non-decomposed corpses of sufficiently nourished deportees (Table 3.14). Average weight: 57 kg. Weight of wood required for cremation: 31.92 kg. Weight ratio: 0.56. 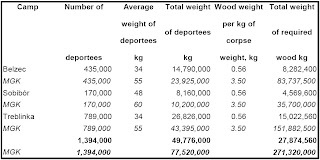 Table 3.16 shows the distribution of deportees to Sobibór according to the above categories and the respective wood weights required to burn the corpses. These average wood weights will in the following be used to estimate wood requirements at the other three Nazi extermination camps. Regarding Bełżec, my chronological breakdown of deportations based on Arad’s deportation list, assuming a similar temporary distribution of the 434,508 deportees mentioned in the Höfle Report leads to the figures shown in Table 3.17. Applying the same criterion as in regard to Sobibór, it is assumed that the corpses buried until August 1942 inclusive were in an advanced state of decomposition in which they had lost all or most of their water content (category "B"), while those buried later, despite having presumably also undergone significant dehydration, are for good measure counted as non-decomposed corpses of malnourished deportees (category "C"). Wood requirements would thus have been as shown in Table 3.18. As concerns deportations to Treblinka, a similar exercise as was done regarding Bełżec can be done for the year 1942, applying the monthly percentages of arrivals according to a chronological breakdown based on Arad’s deportations list to the 713,555 deportees in 1942 mentioned in the Höfle Report, and assuming that Höfle’s figure does not include the 8,000 deportees from Theresienstadt in October 1942 mentioned by Arad. The result is shown in Table 3.19 below. Regarding 1943 the latest breakdown is that of Polish historian Młynarczyk, who calculated a minimum death toll of 780,863 for Treblinka, considering 713,555 deportees in 1942 according to the Höfle Report and another 67,308 documented deportees in 1943. The latter figure consists of 53,149 deportees from the General Government or the Bialystok District and 14,159 deportees on long-range transports from Saloniki, Macedonia and Thessaloniki in later March, early April and May 1943. Given that wholesale systematic cremation of corpses at Treblinka started only after a visit of Himmler’s at the end of February/beginning of March 1943 (see section 2.3), one doesn’t go wrong in assuming that the all bodies buried in the previous year had reached an advanced state of decomposition corresponding to categories "A" (deportees from Theresienstadt) and "B" (deportees from the General Government). Deportees from the GG or the Bialystok District in 1943 are considered in category "C", long-range transports in that year in category "D". The corresponding wood requirements calculation for Treblinka is shown in Table 3.20 below. Table 3.21 shows the results of wood requirements calculations for all three camps, assuming the average wood weight per corpse established above for each camp and the rounded numbers of corpses as in Table 3.4. 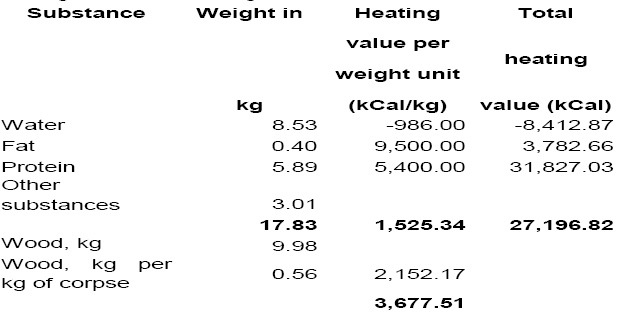 The above calculations assume the use of dry, seasoned wood such as was used by Dr. Lothes and Dr. Profé in their carcass burning experiments. With freshly cut wood the amount required would have been somewhat higher. 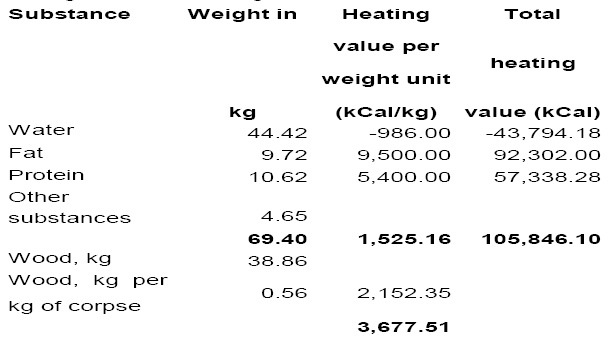 According to Mattogno, Graf & Kues, "1 kg of dry wood (20% humidity) with a calorific value of3,800 kcal/kg is the equivalent of 1.9 kg of green wood". Assuming this is correct, and that the extermination camps could only obtain green wood for burning the corpses, the wood quantities in Table 3.21 would have to be multiplied by the factor 1.9, yielding the figures in Table 3.22. 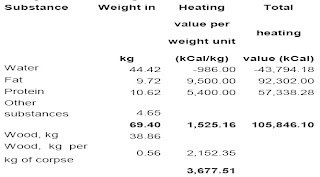 The assumption underlying these calculations is that wood required for burning was wholly or mostly procured by inmate woodcutting teams from the respective camp in the forests surrounding that camp. This is the assumption made by several historians and gratefully taken up by "Revisionists", but it is hardly a given that the camps were dependent on what wood they could obtain by their own workforce, and to the extent that what this workforce could obtain was not sufficient it is likely that additional wood was brought in by train or truck from lumberyards elsewhere. Obtaining up to ca. 21,000 tons of dry wood or 40,000 tons of fresh wood from labor camps or forestry enterprises, over a period of roughly one year, cannot have been much of a problem in a lumbering country like Poland, which had an enormous wood production as far back as 1921: according to an article written that year by then Polish Prime Minister Wincenty Witos, Poland’s state forests alone furnished 3,439,047 cubic meters of building timber and 2,019,758 cubic meters of fuel wood. Privately owned wood preserves, according to the same article, yielded 25,000,000 cubic meters of wood per annum, of which only 12,000,000 cubic meters were used to satisfy domestic requirements of reconstruction, fuel, mining etc. while the rest could be exported. According to a source mentioned by Mattogno, Graf & Kues, the weight of freshly cut red pine (the kind of wood abounding in the Sobibór area) is 880 kg per cubic meter, which means that 40,000 tons of fresh wood would have a volume of ca. 45,500 cubic meters, a mere 0.35% of the export yield of 13 million cubic meters or 0.18% of the total yield of Poland’s privately owned wood preserves of 25 million cubic meters in 1921. Transporting 40,000 tons of wood over the aforementioned one-year period would have required a mere 8,000 five-ton-truckloads or 1,600 railway freight cars. Sobibór extermination camp, with a calculated requirement of about 3,500 tons or dry wood (Table 3.21) or 7,000 tons of fresh wood (Table 3.22) would have required a maximum of 1,400 truckloads (4 per day) or 280 railway freight cars (one nearly every day) to satisfy its cremation wood requirements. When I was at Sobibór in October 2008 , I incidentally witnessed the loading onto a freight train of wood that, according to these calculations, could have kept that camp’s corpse pyres burning for several days (Image 3.1 shows a wood-loaded train standing at the Sobibór side track on 16.10.2008). The realistic possibility of wood supplies being mostly brought into the camp by rail and/or truck renders irrelevant "Revisionist" considerations about the incompatibility of cremation wood requirements with available woodcutting labor and deforestation around the camp observable on air photos, as it means that only a part of the required wood had to be cut by each camp’s own inmate lumbering teams. However, considering the wood requirements established above these teams made or could have made a larger contribution to cremation wood supply than Mattogno, Graf & Kues would like them to. According to the "Revisionist" authors, a team of 30 inmates of the Sobibór forest detail would have been able to handle (0.55 x 30 =) 16.5 tons of wood per day. The camp’s daily requirements of fresh wood between October 1942 and October 1943 would have been ca. 18.3 tons (6,666.7 ÷ 365), i.e. Sobibór would have been nearly self-sufficient as concerns cremation wood. Assuming that the forests in the area at the time contained only 224 m³ of wood per ha, corresponding to 197 tons of wood the total amount of wood required would correspond to ca. 34 hectares. According to Arad, the Sobibór Waldkommando was 40 men strong, which according to MGK’s considerations would mean a capacity of about 22 tons of wood per day, in excess of the camp’s daily requirements of fresh wood for cremation. At Treblinka, the forest team originally consisted of a few dozen prisoners but was enlarged when the cremation of the corpses started. To how many men the team was enlarged does not become apparent from the source, but it seems reasonable to assume that a detachment starting out with at least 24 members (a few dozen is at least two dozen) and then reinforced ended up numbering 60 to 80 of the permanent inmates of Treblinka extermination camp, which numbered between 500 and 1,000 in total. The burning of the bodies at Treblinka lasted at least from March or April to August 1943, but probably until the end of October 1943, i.e. 5 to 7 months . In this period a team of 60 to 80 men could, according to MGK’s above calculations, have handled 33 to 44 tons of wood per day, corresponding to between 4,950 and 6,600 tons within 150 days (five months) and between 6,930 and 9,240 tons within 210 days. These amounts would correspond to at least 27 % but possibly as much as 51 % of the camp’s cremation wood requirements as shown in Table 3.22. The area of forest thus felled by the Treblinka forest team, assuming 197 tons of wood per hectare, would be between 25 and 47 hectares. Wood could to a large extent be replaced as a combustion agent by gasoline or other liquid flammables. 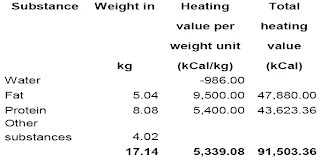 Mattogno, Graf and Kues inform their readers that the fuel value of gasoline is 10,500 kcal/kg and that "in order to replace the heat produced by 100 kg of fresh wood, ([2,000×100]÷10,300=] 19,4 liters of kerosene (or 19 liters of gasoline)" would have been required. Applying the 100 kg of fresh wood = 19 liters of gasoline equation to the wood amounts in Table 3.22, the amounts of gasoline required to burn the corpses at the three Aktion Reinhard(t) camps would have been as shown in Table 3.23. Wholesale cremation lasted at least 5 months at each of the camps Bełżec and Treblinka  and 12 months at Sobibór, signifying the average monthly and daily requirements shown in the same table. 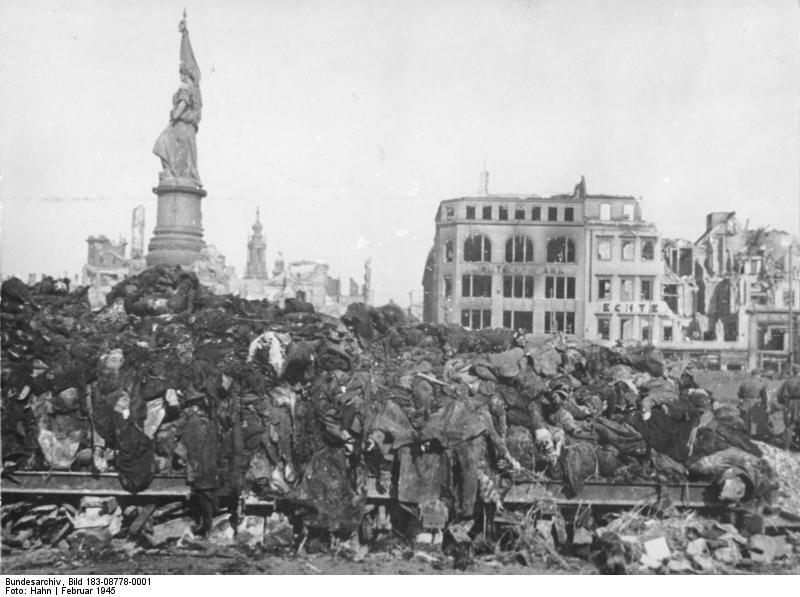 After the Allied bombing of Dresden on 13/14 February 1945, a total of 6,865 corpses were burned on the Altmarkt square to prevent the outbreak of epidemics. The amount of wood used to burn these corpses was minimal – just what little could fit between the bottom of the grid and the surface of the square, as can be seen on pictures like the one shown as Image 3.2 below. The Steel girders had been winched out of the ruins of the Renner department store on the Altmarkt and these had been laid across crudely collected piles of sandstone blocks. A gigantic grill over twenty-feet long was being erected. Under the steel girders and bars were poked bundles of wood and straw. On top of the grill were heaped the corpses, four or five hundred at a time, with more straw between each layer. The soldiers trampled up and down on top of this rotting heap, straightening the victims, trying to make room for more, and carefully building the stack. […] Finally gallons of gasoline, sorely needed though it was throughout the whole Reich, were poured over the stacks of victims. A senior officer cleared the Altmarkt square of all unnecessary by-standers, and set a match to the heap. Corpses were shipped in and laid out ready for registration and, if possible, identification. Searching for ways of keeping them off the ground – and allowing a draft under the planned funeral pyres – workers found a solution in the wreck of a nearby department store, where massive window shutters had survived the bombing. They carried them from the ruins and set them down on the ground, making, as a contemporary grimly expressed it, "huge grill racks." Large amounts of gasoline were trucked into the sealed city center. Teams poured petrol over the bodies as they lay piled on the shutters. Then the dead were burned at the rate of one pyre per day, with around five hundred corpses per pyre. The task was efficiently done. To reduce that number of human remains to fine ash without access to a purpose-built crematorium is a technically problematic process. It was carried out under the supervision of outside SS experts. They were said to be former staff from the notorious extermination camp at Treblinka. Between February 21 and March 5, when the last pyre was lit, 6,865 bodies were burned on the Altmarkt. Afterward, when the fire cooled down, it was estimated that between eight and ten cubic meters of ash covered the cobbled surface of the medieval square. The SS in charge of the burning had intended to transport the ashes out to the Heath Cemetery in boxes and sacks and bury them containers and all, but municipal parsimony triumphed. In the end the ashes were simply emptied out of their containers and into the prepared pits, thus enabling the valuable sacks and boxes to be reused. Besides the corpses’ being reduced to ashes, the above quote conveys the importance of allowing a draft under the funeral pyres, as well as the duration of each pyre – one day, the relatively small amount of corpses burned on each pyre being probably related to the relatively small size of the available grid construction and the fact that the victims were registered and, if possible, identified before burning. The Dresden grid was essentially nothing other than the less fuel efficient of Dr. Lothes and Dr. Profé’s carcass-burning methods – the one in which the grid was placed above the pit, rather than on top of a smaller cavity inside the pit -, except that no pit could be made in the cobbled surface of the medieval Altmarkt square. So the burning process at Dresden was, if anything, less efficient than in the two veterinarians’ experiments which, as explained above, were reproduced on an enormous scale by the SS at Treblinka and the other Nazi extermination camps. On the other hand, the possible presence of Treblinka "experts" at Dresden, mentioned by Taylor, suggests that cremation at Treblinka may also have chiefly relied on gasoline as external combustion agent. If so, the maximum average daily amount of gasoline required for cremation at Treblinka, as shown in Table 3.23, would have been roughly 23,000 liters. To put this amount into perspective, picture a small but busy gas station with 2 filling pumps having 3 fueling nozzles each, 12 cars per hour filling up at each nozzle (1 every 5 minutes) and an average of 30 liters of gasoline per filling. After 12 hours, this small gas station will have turned over 2 x 3 x 12 x 30 x 12 = 25,920 liters of gasoline, more than the above-mentioned daily amount for cremation at Treblinka. A single large tank truck can carry 21,000 to 34,000 liters of gasoline. A sufficiently dimensioned gas deposit provided – Treblinka is known to have had a gas deposit, which was set on fire and exploded during the revolt on 2 August 1943 - , this extermination camp would have had no more logistical problems than the small gas station in the above example. Schelvis’ assumption regarding the reason behind this message is not convincing, insofar as lack of fuel for the gassing engines cannot have been the problem leading to this special request of Globocnik’s. For even if it ran without interruption during daylight every day (which was hardly the case), a gasoline engine from a tank or truck in idle mode would hardly consume as much fuel as if the same engine had been powering a tank or truck in combat duty or carrying supplies or troops for hours on end every day, and no more than three such engines were operating at the same time in the camps of Aktion Reinhard(t). The fuel required to run the gassing engines was thus probably the least of Globocnik’s concerns. On the other hand, the date of his request coincided with the time in which preparations were presumably being made for cremating the corpses at Sobibór, after it had been decided to no longer bury them out of concern about possible pollution of the camp’s water supply. It is likely that Globocnik foresaw the need of high amounts of fuel for cremating the bodies at Sobibór. The "large shipments from abroad" mentioned in the message may have been upcoming deportations from Slovakia, which largely took place in October 1942. MGK’s other objection against gasoline is "its volatility; by the time the corpses would have been thoroughly doused, ignition could have caused an explosion of the gasoline/air mixture". 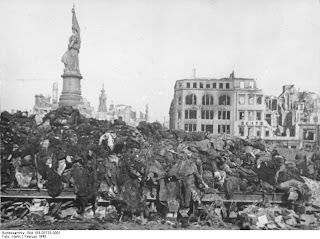 If so, this risk would also have been present on the Dresden Altmarkt, where it seems to have been managed, there being no reason why it should not have been managed at the extermination camps as well – moreover as gasoline need not have been the only liquid fuel used for burning at these camps. It can thus be concluded that, far from being the logistical nightmare that "Revisionists" claim with their unrealistically high estimates, fuel requirements for cremating the corpses at the Nazi extermination camps were manageable and presented no major logistical problems for the Nazis if (as can be assumed considering the Nazis’ trial and error approach) an adequate cremation procedure was adopted. Mentioned in "Hölle des Judentums", article in about the Ringelblum Archive in Spiegel magazine Nr. 29/2010, pages 46/47. A English translation of this article is available online. See the Bonn District Court’s judgment Landgericht Bonn v. 30.3.1963 (hereinafter "LG Bonn Chełmno"), quoted in Adalbert Rückerl, NS-Vernichtungslager im Spiegel deutscher Strafprozesse (hereinafter "Rückerl, Vernichtungslager"), 2nd edition 1978 by Deutscher Taschenbuch Verlag GmbH & Co. KG, Munich, pages 252 – 295. The deportation data mentioned in the text are in Rückerl, Vernichtungslager, pp. 288-89. Carlo Mattogno, BEŁŻEC E LE CONTROVERSIE OLOCAUSTICHE DI ROBERTO MUEHLENKAMP (hereinafter "Mattogno, Controversie"), p.14; English translation: Bełżec or the Holocaust Controversy of Roberto Muehlenkamp (hereinafter "Mattogno, Controversy"). Quotes are from the English translation. According to the my calculations in the blog Belzec Mass Graves and Archaeology: My Response to Carlo Mattogno (4,1) (hereinafter "Bełżec Response 4(1)"), children made up at least 42.1 % of deportees to Bełżec from the General Government’s Galicia district. Arad, Reinhard, pp. 141/142, mentions some 8,000 deportees from Theresienstadt between 5 and 25 October 1942, which are probably not included in the figure of 713,555 Jews delivered at Treblinka until the end of 1942 according to the Höfle Report. In 1943 there arrived a recorded 53,149 (including 2,000 Sinti and Roma, whose size and physical condition resulting from privation is assumed to have been similar to that of the Jews) from the General Government and the Bialystok District and 14,159 from Saloniki, Macedonia and Thessaloniki (Jacek Andrzej Młynarczyk, Treblinka – Ein Todeslager im Rahmen der "Aktion Reinhard", in: Bogdan Musial (editor), Aktion Reinhardt Der Völkermord an den Juden im Generalgouvernement 1941-1944, pp. 257-281, here pp. 280f.) So out of a total of 788,863 deportees to Treblinka, only 22,159 – less than 3 % - did not come from places of utter misery on former Polish territory. Regarding the total number of deportees to the AR camps see note 1 of the blog Mattogno, Graf & Kues on the Aktion Reinhard(t) Mass Graves (1). See Judgment LG Hagen vom 20.12.1966, 11 Ks 1/64 (as note 19). The Hagen Court expressly pointed out that the total figure it arrived at made no claim to historical completeness but was merely a minimum number established for judicial purposes, and that the actual number might well be up to 100,000 higher. Schelvis 2007, pp. 197 ff. E.M.B. Clements and Kathleen G. Picket, "Body-Weight Of Men Related To Stature, Age And Social Status. Weight Of Scotsmen Measured In 1941", Brit. J. prev. soc. Med. (1954) 8, 99-107, copy online. The average weight for all age groups is stated in Table I on page 100. (63 + 61) ÷ 2 = 62. MGK claim that children in long-range transports from outside the occupied Polish or Soviet territories were predominantly above the age of ten and that their weight was thus about half that of adults (MGK, Sobibór, p. 132). Carlo Mattogno, Combustion Experiments with Flesh and Animal Fat on cremations in pits in the alleged extermination camps of the Third Reich (hereinafter "Mattogno, Experiments"). Available on the thread January 2005 TAHC Report of the Holocaust Controversies forum (the web archive link is inactive). MGK (Sobibór, p. 135) claim that the only reliable data regarding fuel requirements in (open-air) carcass burning refer to the use air curtain burners, devices for the cremation of carcasses that consist of a burner and a powerful blower linked to an enclosure of refractory material or to a ditch into which the carcasses are placed. They mention a case in which the burning of 16.1 tons of carcasses required 49 tons of timber with an average humidity of about 20 percent, a wood weight to carcass weight ratio of 3.04 to 1. However, air Curtain incinerators are not noted for fuel efficiency, according to the TAHC’s aforementioned General Guidelines for the Disposal of Carcasses, whereby air curtain incineration is "fuel intensive" (p. 9). These guidelines on the other hand mention fuel-to-carcass ratio much lower than MGK claim for the experiment they mention: "The materials required are wood (in a wood: carcass ratio of from 1:1 to 2:1), diesel fuel for both the fire and the air-curtain fan, and properly trained personnel. For incineration of 500 adult swine, the requirements are 30 cords of dry wood and 200 gallons of diesel fuel." (p. 8) The mentioned ratios are in line with the United States Department of Agriculture (USDA)/TAHC report on an experiment of burning swine carcasses at Pilot Point, Texas, on 19-20 December 1994. They are also in line with a communication sent to me by Mr. Norbert Fuhrmann, sales manager of Air Burners LLC in Florida, USA, which is quoted in the blog Carlo Mattogno on Belzec Archaeological Research - Part 4 (2) (hereinafter "Bełżec Research 4(2)"). According to Mr. Fuhrmann: "A good rule of thumb is that you need roughly in tons the same amount of wood waste as the weight of the carcasses for bovines, pigs, horses, sheep, etc. For 5 tons of carcasses you need 4-5 tons of wood waste." These equally reliable sources conveniently omitted by MGK show that carcasses can be burned at a much lower wood-weight-to-carcass-weight ratio than in the cases they mention. William A. Geering, Mary-Louise Penrith, David Nyakahuma, Manual on Procedures for Disease Eradication by Stamping Out, Part 2, Chapter 3 Methods of Disposal. See the blog Belzec Mass Graves and Archaeology: My Response to Carlo Mattogno (4,2) (hereinafter "Bełżec Response 4 (2)"). MGK (Sobibór, p. 135) claim that this and other directives " cannot be utilized as such, either because they also mention fuels other than wood (straw, coal, liquid fuels) or because they refer to the initial layout of the pyre, allowing for the addition of fuel depending upon the progress of the incineration" – hardly a convincing argument insofar as the wood-weight equivalents of fuels other than wood can be calculated and the theoretical possibility to add additional fuel doesn't mean that any more fuel than recommended in the directives was or needs to be used. This argumentation, however, doesn’t keep MGK from trying to use one such directive to their advantage, as they refer to IAEA guidelines for carcass burning (Mercer J.A., Hesketh N., Hunt J., Oughton D.H, Burning of Carcasses) to claim that 350 kg of ashes per ton of animal from the burning of a beef carcass, mentioned in that article, contain 60 kg of carcass ash (6 % of 1,000 kg) and 290 kg of wood ash, which are supposed to correspond to (290÷0.08=) 3,625 kg of wood, signifying a wood-to-carcass weight ratio of 3.6 to 1. This calculation fails to consider the fact that solid flammables other than wood (namely coal) are used in the procedure recommended by Mercer et al, besides the possibility that the carcass residue factor in cremation according to this procedure was higher than assumed by MGK. For further discussion of this issue see section 5. According to the my calculations in Bełżec Response 4 (2). MGK (Sobibór, p. 136) mention the incineration of 2,268 tons of poultry carcasses in Virginia by means of 10,000 tons of wood, a wood weight to carcass weight ratio of 4.4 to 1. However, a look at M&G's source (Peer, Robert W., Gary A. Flory and Eric S. Bendfeldt, Incineration of Mass Quantities of Poultry Carcasses: Lessons Learned from the Virginia Avian Influenza Outbreak in 2002) shows that incineration of poultry carcasses can hardly be taken as a representative case. For according to the contractor hired to burn the poultry carcasses, the same were difficult to burn - more difficult than swine "because the swine have more fat and do not have feathers that can retain water". In this particular case, furthermore, the quality of the wood used left much to be desired: "rotted wood", "small diameter (brush)", "saturated wood", "too much metal". The management of the operation was also not the most efficient, leading MGK's source to point out that "Once the fire has reached operating temperatures, carcasses need to be loaded across the length of the fire box to avoid cooling of the fire by "clumps" of cool carcasses" - apparently this was not possible because the contractor didn't have "enough trained operators to load no more than 2 - 3 hours per shift". Jeremy Elton Jacquot, More Eco-Friendly Funeral Pyres Introduced in India; Bruce Wallace, Hindus Urged to Adopt "Green" Cremation; Tripti Lahiri (AFP), New 'green' pyre to cool planet while burning India's dead; Aarti Dhar, Making funeral pyres eco-friendly. Jacquot, as note 108. MGK (Sobibór, p. 133ff.) mention the Mokshda Green Cremation System together with a cremation oven known as the Teri apparatus and an "improved open fire system using a metal grate" known as the "Fuel Efficient Crematorium". Combustion efficiency is best in the Teri oven, with a wood weight to corpse weight ratio of 1.8 to one; next comes the Mokshda Green Cremation System with a ratio of 2.14 to 1, a combustion efficiency that MGK consider "good", and the "Fuel Efficient Crematorium" with a ratio of 3.9 to 1, which means "poor" fuel efficiency for MGK. The latter is postulated to be a standard value for the cremation of corpses on the grates at Sobibór, without MGK explaining on what basis, other than convenience, they consider the comparatively inefficient "Fuel Efficient Crematorium" to be what most resembles the grates of Sobibór. On page 6 of MGK's source about the Mokshda Green Cremation System (Global Environment Facility, CEO’s notification to GEF Council Members dd. March 13, 2008), one reads that "due to unscientific design, poor quality of material of construction […], such IWC could not achieve the desired fuel efficiency […]." Aren't the camp’s SS supervisors supposed to have done things efficiently? See the blogs Bełżec Response 4 (2) and Animal Carcass Burning Experiments by Dr. Lothes and Dr. Profé (hereinafter "Animal Carcass Burning"). Alan R. Shapiro, The Use of Air Curtain Destructors for Fuel Reduction. Dr. Lothes und Dr. Profé, "Zur unschädlichen Beseitigung von Thiercadavern auf dem Wege der Verbrennung", in: Berliner Thierärztliche Wochenschrift, Year 1902, No. 37, pp. 557 to 560, online translation and digital copy [Broken link replaced on 03.03.2012 - RM.] (hereinafter "Lothes and Profé"). LG Düsseldorf vom 22.12.1970, 8 Ks 1/69, see quote in section 2.3. Bruce V. Ettling, "Consumption of an Animal Carcass in a Fire", in: The Journal of Criminal Law, Criminology, and Police Science, Vol. 60, No. 1 (Mar., 1969), pp. 131-132. Ibid. The Nazi extermination camp source referred to by Ettling is Steiner, Jean-Franc[o]is, The Revolt at Treblinka, Simon and Schuster, 1967. Regarding Bełżec, see Mattogno, Controversie, page 14. As Mattogno here explained the calculations underlying his assumption regarding the maximum capacity of the mass graves (8 corpses per cubic meter), which is stated in Mattogno & Graf’s Treblinka book (M&G, Treblinka, p. 137), the live weight he considered for Bełżec was also used for the Treblinka calculations in Table 3.4. Regarding Sobibór, see MGK, Sobibór, p. 136. Australian Museum webpage Stages of Decomposition: Butyric fermentation; Dry decay. See also the further sources mentioned in Bełżec Response 4 (2). The human body is 61.8 percent water by weight. Protein accounts for 16.6 percent; fat, 14.9 percent; and nitrogen, 3.3 percent of human body weight. Other elements constitute smaller percentages of body weight. (Webpage The Human Body - What Percent Of Human Body Weight Is Water?). According to a German encyclopedia site, a human being weighing 70 kg carries around 42 kg of water, which means that its corpse, after the water has left it, will weigh only about 28 kg or about 40 % of its original weight. Arad, Reinhard, p. 175: "At first an inflammable liquid was poured onto the bodies to help them burn, but later this was considered unnecessary; the SS men in charge of the cremation became convinced that the corpses burned well enough without extra fuel." P. 176: The bodies of victims brought to Treblinka in transports arriving after the body-burning began were taken directly from the gas chambers of the roasters and were not buried in the ditches. These bodies did not burn as well as those removed from the ditches and had to be sprayed with fuel before they would burn." International Energy Agency webpage Coal: "Coking coal refers to coal with a quality that allows the production of a coke suitable to support a blast furnace charge. Its gross calorific value is greater than 23 865 kJ/kg (5 700 kcal/kg) on an ash-free but moist basis." See the sources mentioned in Bełżec Response 4 (2), fn 253. See the examples mentioned in Bełżec Response 4 (2): Elimination of the carcasses of animals that have died from anthrax and burning of animal bones in a power plant at Schweinfurt, Germany (Dr. Gerhard Glöckner, Abfallwirtschaft des Landkreises Aschaffenburg). Available for download as a Word document on the site Epynt-disaster.co.uk. In this respect the report contains contradictory information, first mentioning 4,000 tons of coal for the burning of 21,000 carcasses weighing 1,050 tons and then speaking of 20,000 tons of ash, an amount well in excess of the combined weight of carcasses and coal. As concerns the carcasses’ deterioration, it is possible that the previous failed attempt to burn them, rather than decomposition, was the main hindrance factor in this respect. According to "the intelligent woman's guide to cremation", people who have died in fires are difficult to cremate "as the charring makes a crust that doesn't ignite well". Flaminio Fidanza, "Effects of starvation on body composition", The American Journal of Clinical Nutrition 33: July 1980 pp. 1562-1566, online reprint, cited in MGK, Sobibór, pp. 138f. See e.g. Bolender, as quoted in Schelvis 2007, pp. 110 f.: "The first grave had been covered with a layer of sand. As this grave was completely full, the other bodies had to be taken elsewhere, even though the new grave was not yet ready." The semi-starved test person’s weight of 52.60 kg was made up by 38.22 kg of water (72.65%), 0.62 kg of fat (1.17%), 9.12 kg of protein (17.33%) and 4.65 kg of other substances (8.84%). 64 % water, 14 % fat, 15.3 % proteins and the rest other substances – MGK, Sobibór, p. 137. Ibid. The total of 788,863 Treblinka victims is based on the assumption that the 8,000 deportees from Theresienstadt in October 1942 are not included in the Höfle figure and were thus not considered by Młynarczyk. Thus MGK (Sobibór, pp. 141 f.) quote Schelvis’ writing whereby "The cremation of the exhumed bodies, of which there were already more than 100,000, required huge quantities of wood, but plenty could be found in the neighbouring forests. A Waldkommando was formed, consisting of about thirty Arbeitshäftlinge. They had to cut down large numbers of trees and chop up the wood under the supervision of a few SS-men and Ukrainian guards." Evidence to such transports is hard to come by because camp records were destroyed (see Globocnik’s letter to Himmler of 5.1.1944, Nuremberg Document 4024-PS) and wood shipments were hardly a detail that would under the circumstances catch the particular attention of camp staff members, inmates or bystanders or be of interest to interrogators in the course of criminal investigations, which were about establishing the basic facts of the crime and the deeds of the perpetrators rather than the crime’s logistics. However, one mention of wood brought from outside can be found in Arad, Reinhard, p. 171: «Unterscharführer Becher Warner, who served as a driver in Sobibor from August through November 1942, testified at the Sobibor trial: "The corpses were taken out from the gas chambers and cremated on a specially prepared roaster. The ashes and the remains of the bodies were buried in a specially designated place, and later a forest was planted there … As I have already said, I used to bring foodstuffs to the camp and also wood for cremating the killed …"» (emphasis added). Chełmno extermination camp had several external wood suppliers, including witnesses Michał Radoszewski and Heinrich May (see the blog Mattogno on Chełmno Cremation (Part 2). October 1942 (start of cremations of disinterred corpses at Sobibór) to October 1943. Wincenty Witos, "Prosperity in Poland", New York Times, 7 August 1921 (online copy). MGK, Sobibór, p. 144, Fn. 430. Mattogno (Bełżec, p. 85 f.) claimed that burning 600,000 corpses at Bełżec between December 1942 and March 1943 would have required "for each and every day about 1,064 tons of wood – over 42 freight cars or over 200 trucks". He obviously considered a load of 25 tons per freight car and 5 tons per truck. M&G, Treblinka, p. 151f. ; Mattogno, Bełżec, p. 85; Thomas Kues, Tree-felling at Treblinka; MGK, Sobibór, pp. 144f. MGK, Sobibór, p. 144, referring to a Polish online source. MGK (Sobibór, p. 144f.) claim that "the aerial photographs of the Sobibór region, taken on July 1940 and 30 May 1944, do not show any apparent reduction in the wooded area around the camp – even indicating an increase of the vegetation on the southern side". If so, this could mean that wood was cut further away from the camp. Wood-felling related to the conversion of Sobibór into a concentration camp, ordered by Himmler in July 1943, took place in a forest several kilometers away from the camp – see Yitzhak Arad, Jewish Prisoner Uprisings in The Treblinka And Sobibor Extermination Camps (hereinafter "Arad, Uprisings") Part 4, online. LG Düsseldorf vom 3.9.1965, 8 I Ks 2/64 (as note 36). See the blog If they did it the simple way, they didn’t do it!, data based on Arad, Reinhard, pp. 170, 177, 280, 288 and 373. In Tree-felling at Treblinka, Kues claims that the zones showing traces of deforestation north of the liquidated Treblinka II camp in 1944, if compared to a 1936 map of the area, amount to "10 hectares at the very most". 10 hectares, assuming 197 tons of wood per hectare, would correspond to 1,970 tons of wood – sufficient, at the ratio shown in Table 2.22, to cremate about 85,000 corpses. According to Alex Bay, comparison of air photos from 1940 and 1944 reveals that "more than half of the Treblinka's 53 acres [21 hectares] were cut" and that "even the parts which remained in 1944 had been severely thinned". (Alex Bay, The Reconstruction of Treblinka (hereinafter "Bay, Treblinka"), Reconstruction of Treblinka: Geography of the Locale(Continued). MGK, Sobibór, p. 143, footnotes 423 and 426. See above section 2.3 and note 132. October 1942 to October 1943. David Irving, Apocalypse 1945. The Destruction of Dresden, p. 278f. Frederick Taylor, Dresden: Tuesday, Feb. 13, 1945, pp. 350 f.
 Jules Schelvis, Vernichtungslager Sobibór, 2003 Unrast Verlag, Münster, Germany (hereinafter "Schelvis 2003"). The document is a letter dated 4 September 1942, sent by Globocnik to SS-Hauptsturmführer W. Grotham at the Reichssicherheitshauptamt (RSHA – Reich Security Main Office), a facsimile of which is shown as Document XXII. The gassing engines were in all probability gasoline engines, see Sergey Romanov, Why the "diesel issue" is irrelevant. See section 2.2 and the blog Mattogno, Graf & Kues on the Aktion Reinhard(t) Mass Graves (4). Arad, Reinhard, pp. 140f; Judgment LG Hagen vom 20.12.1966, 11 Ks 1/64 (as note 19, partial translation). Kdeur des OKW-Stabes z.b.V, Sonderbeauftragter des Führers, Bericht Nr. 5: Krakau (Fortsetzung), Tarnow, den 21.8.42, BA (Bundesarchiv = German Federal Archives) NS 3/3794, p.19. See calculation in the blog Mattogno on Chełmno Cremation (Part 2). For the cremation operations at Bełżec and Treblinka; the daily amounts of gasoline required at Sobibór, as shown in Table 3.23, would have been lower than for the Dresden Altmarkt burnings. A regiment of the 21st Panzer Division in Africa consumed 4,400 liters of petrol per day of combat in 1941; the daily consumption of the entire division was 33,000 liters (Pier Paolo Battistelli, Rommel's Afrika Korps: Tobruk to El Alamein, pp. 56/57). MGK, Sobibór, p. 143, footnote 423. In Tree-felling at Treblinka, Kues points out that "The only kind of fuel mentioned by Willenberg in connection with the cremations – which he did not witness firsthand – is crude oil". Rudolf Höß ("Die »Endlösung der Judenfrage« im Konzentrationslager Auschwitz", written in Krakow in 1946, published in: Rudolf Höß, Kommandant in Auschwitz. Autobiographische Aufzeichnungen. Edited by Martin Broszat. 19th edition Munich 2004, p. 243) mentioned having poured oil residues and methanol over the corpses. According to Arad (Reinhard, p. 175) an "inflammable liquid" was poured over the bodies at Treblinka to help them burn.